Ulster Unionist Councillor, Robert Colvin has praised the vigilance of neighbours following the arrest of a suspect burglar on Thursday morning (Janaury 10) inside commercial premises in the centre of Coalisland. 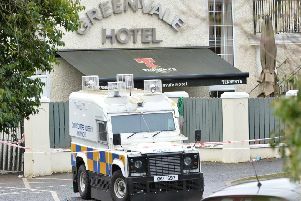 In a statement to the Tyrone Times he also praised the local PSNI for their quick reponse. Councillor Colvin said: “There seems to be an increasing number of robberies throughout the district which is why it pays to be vigilant these days. “I’d like to thank the members of the public who contacted the PSNI so quickly, and to the PSNI for the swift action. “Criminal activity can be reduced with the help of the community, reporting any suspicious activity to the Police. “I am aware of other burglaries that have taken place across Torrent, namely at a recently opened convenice store in Newmills.